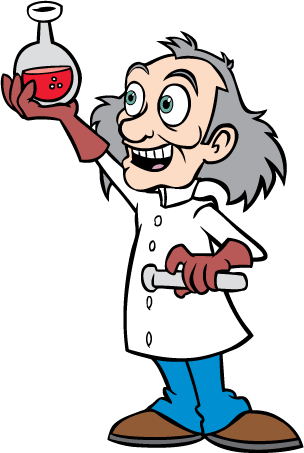 Professor Sauernoggin is a reclusive scientist who tinkers in his lab day in and day out mixing radioactive isotopes. He lived in Puckerville but no one really knew where his lab was located. He never spoke to anyone but was always looking over his shoulder to see if someone was following him. It was as if he were on a mission; a top secret mission. As it turns out, Professor Sauernoggin’s secret mission was to find new ways to convert toxic waste products for useful purposes. The professor is very environmentally conscious, and hoped to find the right potion to save the earth from becoming the dirtiest planet in the galaxy – and from those who seek to make this the dirtiest planet in the galaxy. One day, in an absent-minded moment, he reached for his coffee cup and accidentally grabbed a beaker of toxic potion. He realized his mistake as soon as he had taken his first giant gulp. But by then, it was too late. In an instant, Professor Sauernoggin exploded into a fireball. He had been temporarily transformed into Mr. Toxie Head, an anthropomorphic mushroom cloud. Professor Sauernoggin… er… Mr. Toxie Head was at a loss. What had he done? And how was he going to continue his work to save the planet? But the Professor’s alter-ego didn’t stick around for long. Apparently, the toxic potion had a limited effect. After a brief time, Sauernoggin returned to his old self again. And yet, he knew he could use Mr. Toxie Head in his fight to rid the planet of evil villains who seek to use our planet as their personal trash can. Trash recycling is such an easy thing to do, and most of the products we use today can be recycled. The professor was sad to see that his own community didn’t even have bins to collect glass, paper, and aluminum products so that they could be converted back into raw materials. After they’re made into raw materials, they can be made into brand new products. It’s an amazing cycle. And that’s why they call it re-cycle! But there are other types of trash that are causing even more problems for the planet. Too many people are throwing hazardous waste such as chemicals, paints and cleaning solutions in the garbage. The professor longed for a time where Puckerville – and all towns – would set up special collection sites for people to drop off these items for safe handling and proper disposal. He also wanted his fellow citizens to start buying natural, safe substitutes instead of harmful cleaning products, chemicals and pesticides. 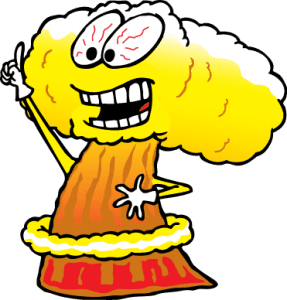 Mr. Toxie Head is the human mushroom cloud that is also Professor Sauernoggin. Mr. Toxie Head uses his super powers to fight against evil polluters and enemies of the environment. While Professor Sauernoggin is passionate about recycling, Mr. Toxie Head has combined forces with the Professor to make sure Planet Earth continues to recycle itself by encouraging kids everywhere to save, save, save. Save aluminum cans, bottles, and paper so they can be recycled. To help save electricity, turn off the lights when you leave your room. To help save trees, use a lunch box and/or reusable containers instead of paper bags to carry your lunch in. To help save water, turn off the water while you’re brushing your teeth. Use it only when you need it. Save old toys and clothes and give them away to Goodwill or have a garage sale. Someone else can always use stuff you don’t want or need anymore. Save money and gasoline by riding your bike wherever it is safe instead of being driven places by your parents. Save trash… and throw it away properly. Don’t litter! But there’s one thing Mr. Toxie Head doesn’t want you to save. Don’t save your voice! Make sure you encourage others to help protect the environment!! Hazmat had a dream. He was only a rat but he longed for so much more. He was Professor Sauernoggin’s mild-mannered, brainy rodent. 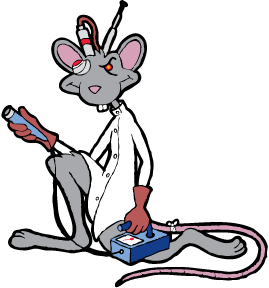 He scurried around the lab wearing a white lab coat just like the professor. In fact, he studied the professor’s every move. His dream was to be just like Professor Sauernoggin one day. Sadly, Hazmat was killed in a freak accident in the lab. The professor was so terribly distraught. He felt as if he couldn’t go on without his four-legged friend. So using all of his skill and knowledge of science, he revived him with various bionic implants. Hazmat’s back, but he’s not quite the same rodent he used to be. He now has a telescopic bionic eye and antenna for broadcasting what he sees back to the professor’s lab. His new-found skills have made him the perfect secret agent to help the Professor in tracking down evil polluters. Hazmat knows the benefits of recycling and keeping the planet green. After all, he lives with recycled parts on his body. He, too, along with the Professor and Mr. Toxie Head works to rid the world of evil villains who seek to disrupt our planet’s ecology. For the part bionic Hazmat, his mission is to keep all water sources clean. After all, he does have to drink the water to survive, and his special rodent instincts serve him well when he needs to travel the sewers and storm drains. Hazmat supports the Clean Water Campaign which is working at the state and local level to protect all sources of drinking water from pollution and addressing the largest source of water pollution: sewage and storm water runoff. Hazmat wants all kids to learn as much as they can about the various ways they can help protect all water supplies all around the world. In the meantime, he’ll be on the lookout for those who break the laws.